Lace Bridal Fabric has long been a popular material due to it's beautiful appearance acheived by it's distinctive open hole design. Lace Bridal Fabric is one of the most popular materials in the fashion industry and due to it's feminine appearance is ideal for elegant bridal gowns. Lace has seen a sharp rise in popularity as a bridal fabric since Catherine Middleton wore a beautiful gown with Lace detailing designed by Sarah Burton for McQueen at her 2011 ceremony. 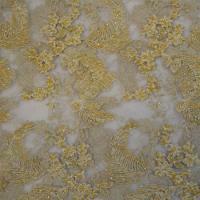 Lace Wedding Dress Material can be used to create a variety of traditional and contemporary bridal gown designs. Our heavy corded Lace Bridal Fabric is ideal to be used as an overlay alongside many of our other bridal fabrics for a unique style of gown and is often a very popular choice for beach weddings. Lace Bridal Fabric is often chosen to add some simple and elegant detailing and our range of lightweight Lace Bridal Fabric is perfect for adding an element of interest to your gown. Our complete range of Lace Bridal Fabrics have a beautiful floral pattern and are available in a variety of colour options designed to compliment our other bridal fabrics including satin and taffeta.